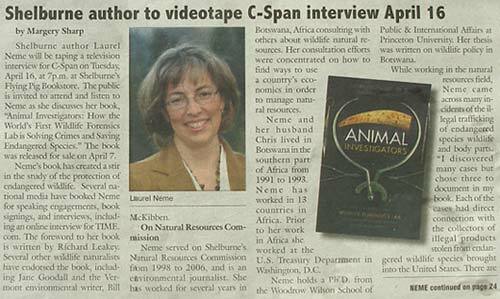 Shelburne author Laurel Neme will be taping a television interview for C-Span on Tuesday, April 16, at 7p.m. at Shelburne’s Flying Pig Bookstore. The public is invited to attend and listen to Neme as she discusses her book, “Animal Investigators: How the World’s First Wildlife Forensics Lab is Solving Crimes and Saving Endangered Species.” The book was released for sale on April 7. Neme’s book has created a stir in the study of the protection of endangered wildlife. Several national media have booked Neme for speaking engagements, book signings, and interviews, including an online interview for TIME.com. The foreword to her book is written by Richard Leakey. Several other wildlife naturalists have endorsed the book, including Jane Goodall and the Vermont environmental writer, Bill McKibben.